I always sign up for Groupon in the city I’m going to visit a few weeks before departing. From the icon above or pick below, click on the arrow next to your city and choose “Other Countries” and then “Italy”, and finally “Venezia”. 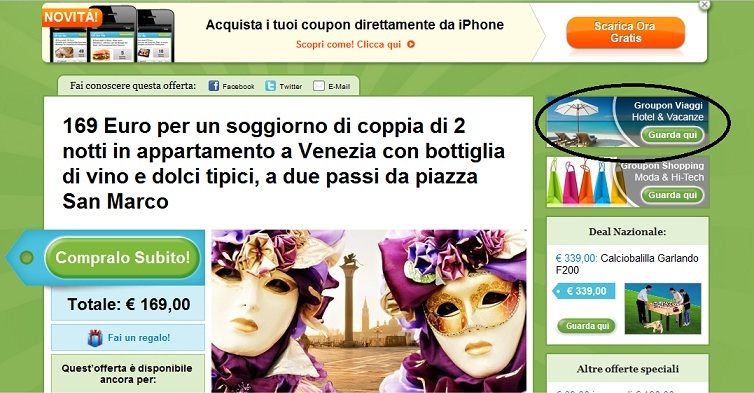 Then click on where I circled the italian banner, because that will take you to the latest hotel and vacation deals in Venice!! Another way, is to simply go to “Other Countries”, select “Italy”, and then “Viaggi” (meaning “trips”) and see the latest offers. This deal below is for 169 euros for 2 people for 2 nights right behind St. Mark’s Square! That’s valid til March 15, 2012 (with some blackout dates). Jump on it!